L’Oreal (OTCMKTS: LRLCY), the world’s biggest cosmetics company, continued its momentum in Q4 ended December 2017 with 5.5% rise in sales to 6.5 Billion euros. The company’s earnings were primarily driven by a strong performance in L’Oreal Luxe segments, active cosmetic division, and emerging markets particularly Asia-Pacific. During the year, L’oreal expanded its digital presence strengthening its positions in two strategic channels: E-commerce, where rose 33.6% y-o-y to reach 2 billion euros and Travel Retail, where L’Oréal continues to dominate. Travel retail sales has been one of the key channels for the company to boost sales of its luxury cosmetics. With growth in passenger traffic and conversion of passengers to buyers, this channel continues to be one of the most important ones for the company. Driven by this strong annual performance, L’Oreal is forecasting double-digit growth in its full fiscal 2018 sales. 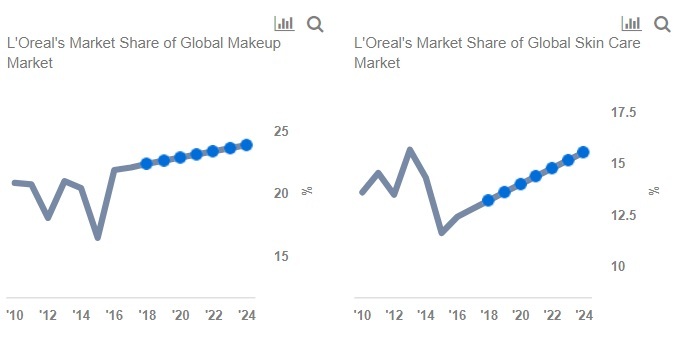 Please refer to our dashboard analysis on L’Oreal. Excellent performance of L’Oréal ‘Luxe’ and ‘Active Cosmetics’ Division – Global growth of the prestige beauty segment is outpacing growth in the mass beauty segment. L’Oreal’s premium brands, as expected, earned the company higher profit margins. L’Oreal’s Luxe Segment delivered a strong double-digit growth in 2017 compared to 2016, driven by makeup and facial skincare sales especially in the Asia-Pacific region. L’Oreal’s Active Cosmetics segment grew to achieve more than 2 billion euros of sales for the first time with La Roche-Posay, Vichy, Cera Ve, and Skinceuticals as the best selling brands. L’Oreal is one of the leading names in the active cosmetics market. In an effort to further grow this segment, L’Oreal acquired skincare brands, CeraVe, AcneFree, and Ambi from Valeant Pharmaceuticals for a sum of $1.3 billion in early 2017. These brands have strengthened the company’s ties with health professionals who are key toward developing products in the active cosmetics market. L’Oreal’s market position in North America, the fastest growing geography for active cosmetics, is expected to further grow enabled by these acquisitions. Sales from emerging markets which include Asia-Pacific, Latin America, Eastern Europe, Africa and the Middle-East exceeded €10 billion in 2017 constituting nearly 40% of the company’s total sales. Growth from Asia-Pacific topped with 18.8% y-o-y growth in the fourth quarter. In comparison, sales grew in single-digits from other geographies with a marginal fall in sales from North America and Africa/MIddle-East. Within Asia-Pacific, China has been a key driver with Chinese travelers being one of the highest spenders both in the domestic and international markets, making this market one of the focus areas for the company to boost its travel retail sales. Western Europe is another key market that has driven L’Oreal’s growth and we anticipate this trend to continue in 2018. The company forecasts a confident outlook for fiscal 2018 with sales to continue to rise reflecting continuing momentum from 2017. We believe that L’Oreal has the key advantages in terms of innovation, brand power, digital prowess, and the quality of its teams all over the world to continue to drive growth and hold on to its leading position in the Beauty market.